Cedar Oil for your pets of any kind! 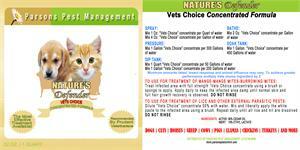 Vets Choice is approved for use on newborn offspring and the nursing mother. This product will successfully control Ear Mites, Mange Mites, Burrowing Mange Mites, Head Lice and Goat Lice. Special Mange Control instructions attached. Recognized as a Flea Control alternative to chemical drop protocol. VETS CHOICE can be diluted in ratios of 400:1 for Livestock Dipping Stations. VETS CHOICE diluted solutions can be used in grooming of Dogs, Cats and other animals. The solution is reusable and can be replenished for extended inexpensive future treatments. The ingredients of VETS CHOICE are Safe to Children and Pets and is now classified as a minimum risk pesticide by the Environmental Protection Agency of the United States of America. Government regulation no longer prohibits the purchase of VETS CHOICE Concentrate by consumers. Human and animal spray recipe's are included on label.